In recent years, various model companies have been releasing kits of World War II era tanks (T-34, KV series, etc) as well as tanks of the cold war to present (T-55, T-62, T-64, T-72, and up through the latest Armata designs). Last year, MiniArt released the T-44 medium tank which started the process of developing the next main battle tank. The T-44 featured a new hull, engine, and drive train that started taking the shape of more modern Russian tank design while the turret was still essentially the T-34/85 design. Here is MiniArt's latest release, the T-44M which still retains the T-34/85-type turret but the hull evolved into the foundation for the the next main battle tank - the T-54/55 series. 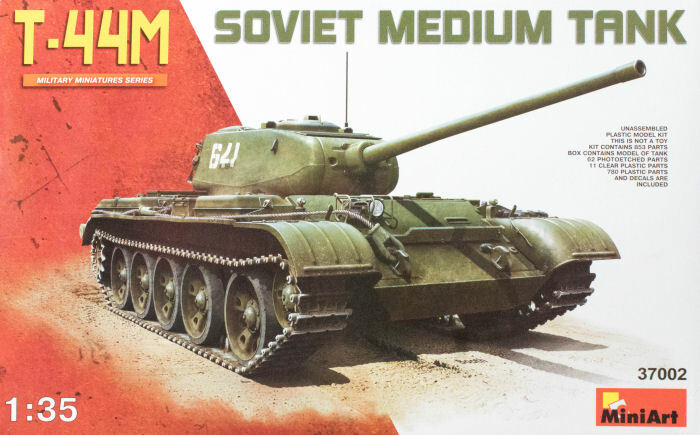 Like the earlier T-44 release, this kit features a full interior (engine compartment and crew compartment) and all of the updated details that hint at a possible T-54 in our future. 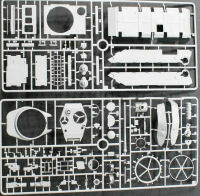 The kit is molded in gray styrene and presented on 65 parts trees plus two trees of clear parts (duplicate trees not shown) and one fret of photo-etched parts. According to the manufacturer, there are 791 plastic parts and 62 photo-etched parts in this box. There is some serious mass to the box when you pick it up. Painting instructions are provided using MIG paint colors which are fine for those that use MIG paints. MiniArt used to provide painting instructions for many different paint brands and it would be nice to see MiniArt return to that solution for those modelers that do not have or do not use MIG paints. This is a nice looking kit and is not over-engineered. Those 853 parts build up a full interior and engine compartment in addition to the exterior and track. We've seen kits from other manufacturers build up similar-sized vehicles with more parts and no interiors at all. I also salute the snap-together one-piece track links so you won't be spending a week building up track.